Pictured above is Lenny Evans. Lenny is a 34 year AMT who has worked for Air Cal as a Lead Mechanic and is now an American Airlines AMT in SAN. Lenny is standing next to his "TopDog Trikes" 582 which has a 65 HP Rotex Engine, dual carb., dual ignition. It also has VOR, VHF and GPS. The white canister on the rear is a ballistic parachute. This photo was taken in Ocotillo Wells, CA on 11/05. 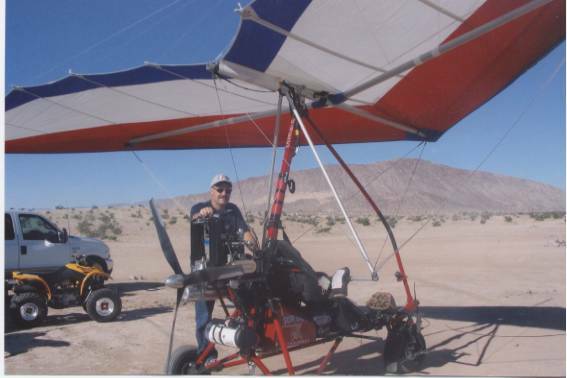 Besides enjoying flying his ultralight Lenny uses his vast aviation maintenance experience maintaining his 582 in airworthy status. Lenny performs his own 100 Hour and Annual Inspections. So the next time you see an aircraft fly overhead, be it a Boeing 767-300, Cessna 172 or an Ultralight aircraft there is a skilled Aircraft Maintenance Technician that is behind the scene ensuring that aircraft flies safe. Lenny Evans is one of the many skilled AMTs that are the "Faces Behind Safety"! Pictured above is George Sayner. George is an American Airlines AMT in SAN. George is a retired USN Master Chief who proudly served our country for over 24 years. 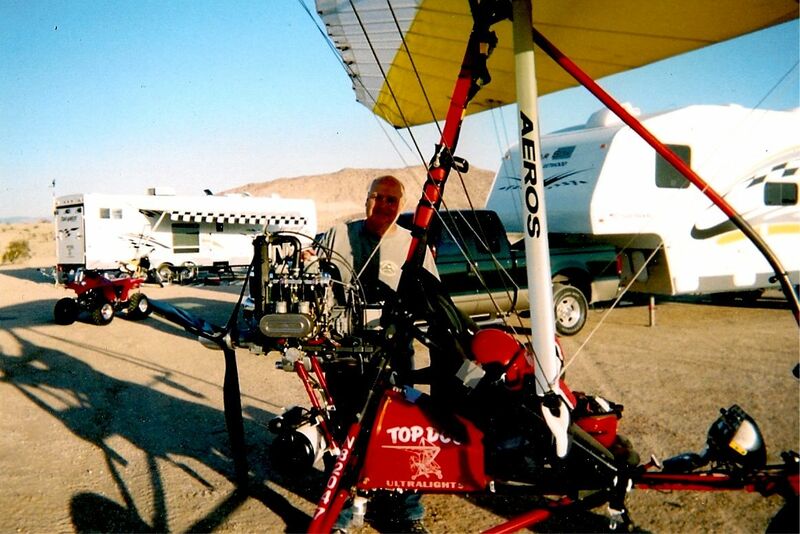 George is standing next to his Experimental Light Sport Aircraft (TopDog 582) Commonly known as a Trike. It has a Rotax 582 engine. George and his long time friend and fellow AA AMT, Lenny Evans, went over every nut and bolt and inspected all materials to ensure they are up to aircraft standards. George started in aviation when he was 15 years old. Washing airplanes for flight time. Then the Navy Reserve at 17. His first airplane he worked on was a A1D Skyraider (Spad) It had a R3350 recip engine. Then P2V Neptune (Antisubmarine warfare plane R3350 and J34's) He was a flight engineer on it also. Next was the F8U Crusader (J57's), then 4 different models of the Mc Donnell Douglass F4 Phantom (B J N S J79's). Next was the A7B Corsair,(TF30) C9B Sky Train(JT8D's). And last but not least was the F14 Tomcat. (TF30's with Afterburners). With a total of nearly 47 years in aircraft maintenance you can tell that George Sayner is a skilled and proud AMT.